The key objective of the Disabled Persons Parking Scheme is to ensure that people with a disability have easier access to services and facilities throughout the state. Vic Roads is responsible for establishing the regulations that govern the scheme. Disabled parking permits are only issued to people with a medical condition that severely affects mobility. 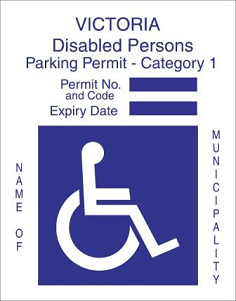 To apply contact Buloke Shire Council on 1300 520 520 or download a Disability Persons Parking Scheme Application. If you are applying for a new Permit the application form must be completed and signed by your doctor. If you need to replace your expired permit (it must be within 3 months of the expiry date otherwise a new application form must be completed and signed by your doctor). Otherwise you only need to complete a Replacement Disabled Persons Permit application form. Pose an extreme risk to themselves or others without the constant attendance of a caregiver. Or for twice the time in a standard parking bay (upon payment of an initial parking fee, if applicable). The permit must be clearly displayed on the left side of the front windscreen, with the expiry date and permit number visible from the outside of the vehicle. A permit is automatically cancelled after the expiry date and may be cancelled at any time for wilful misuse or breach of the Conditions of Use.